Nerja and Frigiliana are beautiful and popular tourist destinations in Malaga, Andalucia. In Nerja we can find a prehistoric cave, also known as the Natural Cathedral of the Costa del Sol. 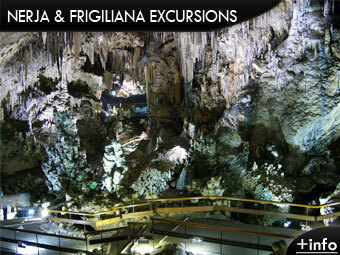 Frigiliana is a beautiful white village, and the excursion includes the visit to Frigiliana and Nerja. An excursion to Nerja ranges between 27 € and 33 €, depending if we want to visit also the Nerja Caves or not; the duration is one day, with regular departures every Monday throughout the year except bank holidays. Each tour to Nerja includes everything you need depending on the chosen trip to fully enjoy the visit and experience. If you plan to go during the winter do not forget to bring warm clothing. During the summer, wear light clothing and a sun hat. The use of comfortable footwear and clothing is always recommended. Where can I book an excursion or tour to Nerja? Malaga to Nerja: Find how to get to Nerja from Malaga by public transport or by car. Car hire in Malaga: Very good optionfor getting to Nerja if you have a driver's license, so you can enjoy all the way and make the stops and breaks as and when needed. Taxis: Compare websites and check price for a taxi from Malaga airport.